Seafarers are required to work together as a team in order to ensure safe and efficient operations on-board ships. This teamwork takes place in a highly complex environment and requires clear communication, leadership and decision-making. When viewed as a whole, the `seafarers and the technical systems that enable control of the vessel are knows as a ‘Joint Cognitive System’ (JCS). To operate successfully, the members of the JCS (both human and technical) must develop a Shared Mental Model (SMM), whereby roles are understood and team members are supported with timely and appropriate communication. Of particular importance is the SMM that is developed between the bridge team and the engineering team. This results from the lack of physical proximity between the bridge and machinery spaces and a cultural legacy that limits on-board communication, particularly between these teams. 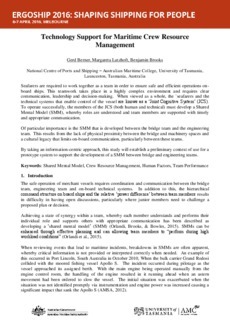 By taking an information-centric approach, this study will establish a preliminary context of use for a prototype system to support the development of a SMM between bridge and engineering teams.